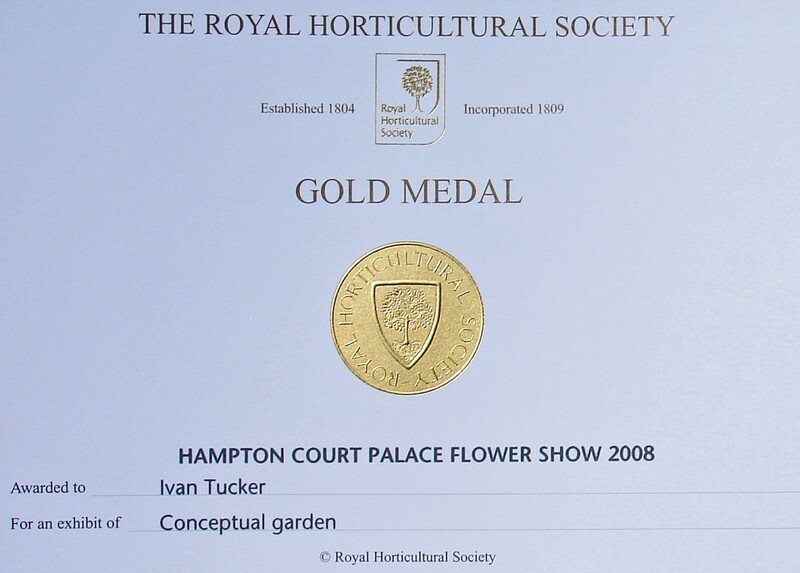 In 2008 I was awarded an RHS gold medal for my garden Forest², in the Conceptual Gardens category at the RHS Hampton Court Palace Flower show. The Conceptual Gardens category was created to explore the interface between gardens and art, using gardens as pieces of conceptual art. In itself, this was not a new idea, having been pioneered by designers such as Martha Schwartz, but with roots dating back to land artists such as Robert Smithson, Michael Heizer, Richard Long and Hamish Fulton, but it was a bold step for the usually conservative Royal Horticultural Society, perhaps in a bid to shake off some of their ‘green welly and Barbour image’ and appear hip to a younger audience who were, ironically being priced out of house (and garden) ownership by the UK property ‘boom’. Building a show garden at Hampton Court was an exhilarating yet stressful experience. Hampton Court is a much larger showground than Chelsea Flower Show, with 25 acres to Chelsea’s 11, and exhibitor;s are allowed 3 weeks build-up as opposed to only 2 for Chelsea. Due to it;s size, Hampton Court is a far less congested site than Chelsea, which is not only incredibly constricted but also in central London. In theory, and usually in practice, this should make Hampton Court altogether less stressful than Chelsea. However, when your tint 35m² garden includes 30 trees, and all 30 of the first batch are rejected after planting, things get more stressful. When the next 30 that turn up get effectively boiled in the bag on the back of a lorry stuck in a traffic jam on the north circular on their way to the show, but only reveal this by shedding their leaves AFTER they’ve been planted, it gets even more stressful as judging and press day approaches. Trying to find 30 more trees from a new supplier having dumped the first one wasn’t ideal and we ended up with bigger trees than intended during an uncharacteristically windy show. The poor landscapers had their work cut out effectively planting 90 trees instead of 30, and trying to make the walls straight enough to take huge, heavy, real glass mirrors, each measuring 2m x 2m. In the end though, the garden was finished on time and we were rewarded with an RHS Gold Medal, and, more importantly, the genuine delight of show-goers. It was worth it in the end.